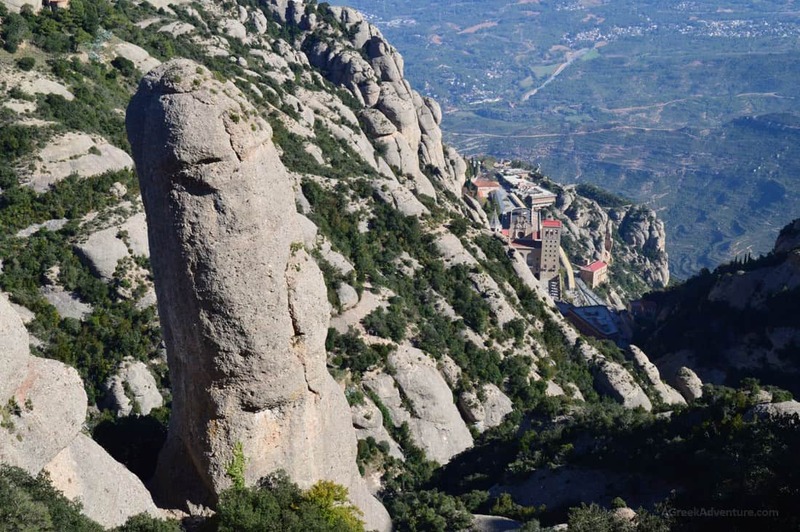 If you think that such this title about Montserrat Barcelona in Spain is a bit “too much” then you haven’t visited this rocky mountain. 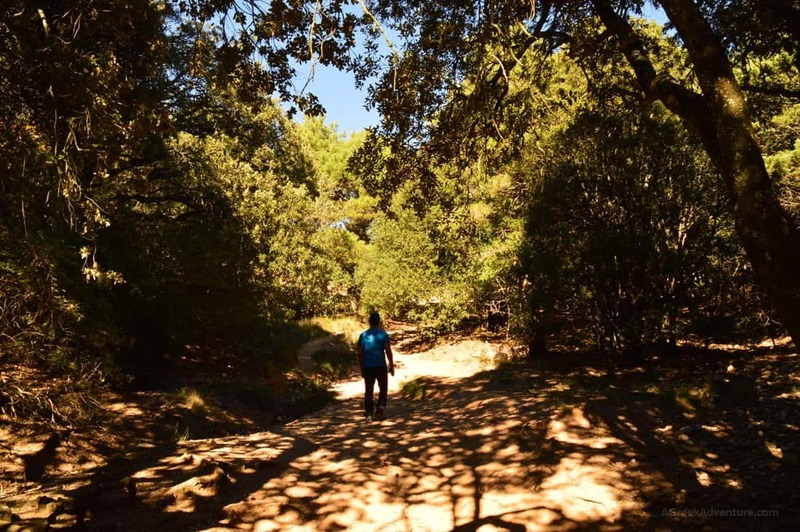 For some, this place is considered to have the Holy Grail hidden inside its mountains. 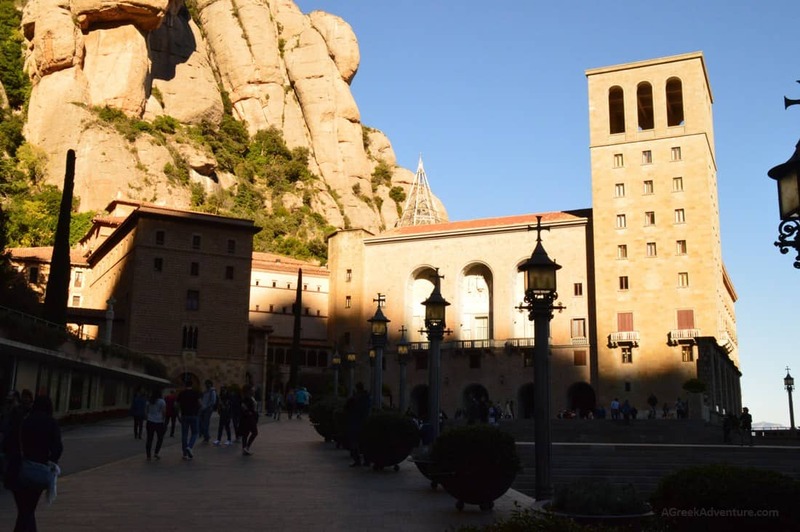 Montserrat outside Barcelona hosts a really big complex of buildings; all to make the visitor (either be it a hiker or a religious pilgrim) feel like he really escaped “from earth boundaries”. To us, it was kind of a self-promise, given a few years ago. This year we did it, along with our visit to Barcelona. We think that a good way to divide the whole area is in 2 main areas. 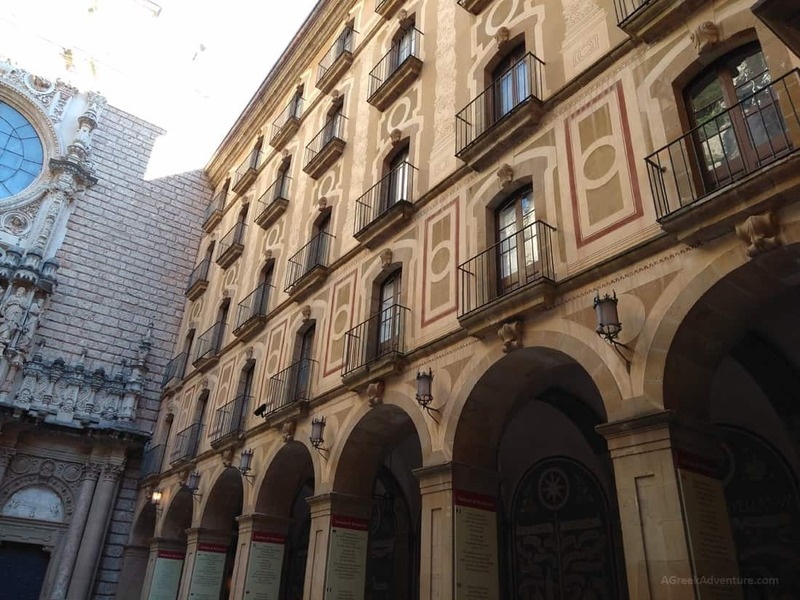 The first one is the main complex where you will see the huge Basilica, the hotel, restaurants, the museum, parking spaces, promenade areas and terraces, gardens, sculptures and more. In this picture below you can get a complete idea of the whole complex. The dominant building is the Basilica of Santa Maria. Below is part of the inner yard before entering the Basilica. This is the upper level yard. There are different levels. At the left side exists a pretty nice hotel. 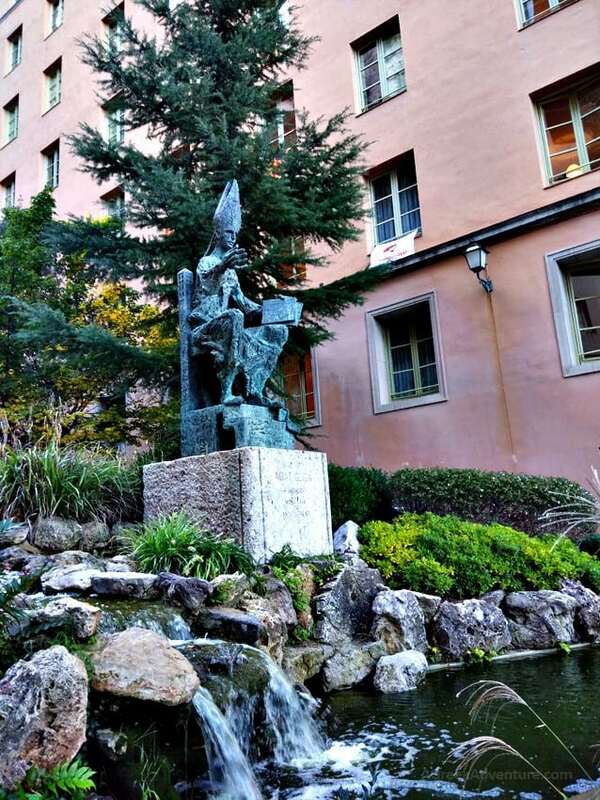 This statue is of Abbot Oliba, founder of Montserrat Barcelona, Spain. 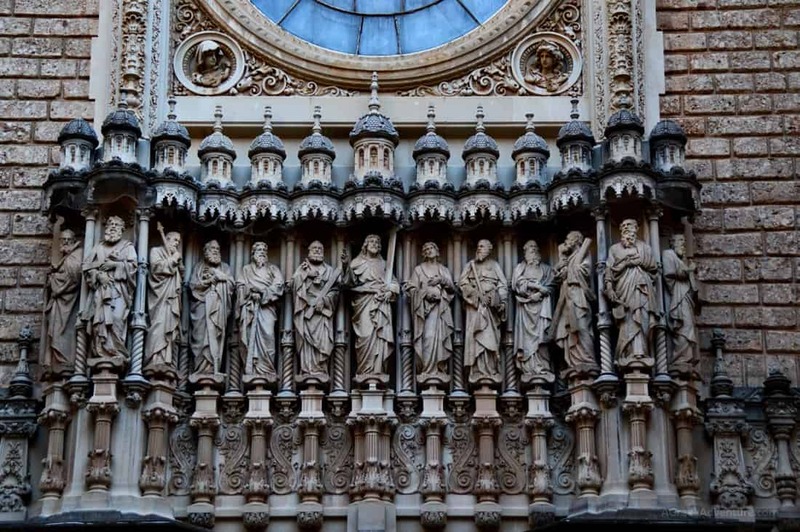 Sculptures that are met outside Santa Maria -in Montserrat Barcelona complex- are one special element of this place as they are not off the classical type, but modern ones. 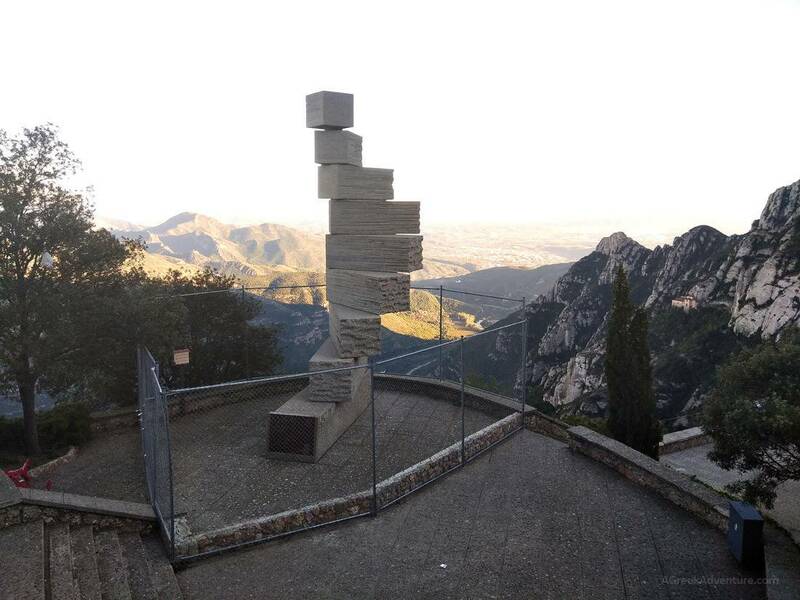 This one is the famous “Stairway to Heaven” ladder/sculpture. It depicts the evolution stages of a person, starting from a basic elemental up to God status. Each block represents a phase of enlightenment. 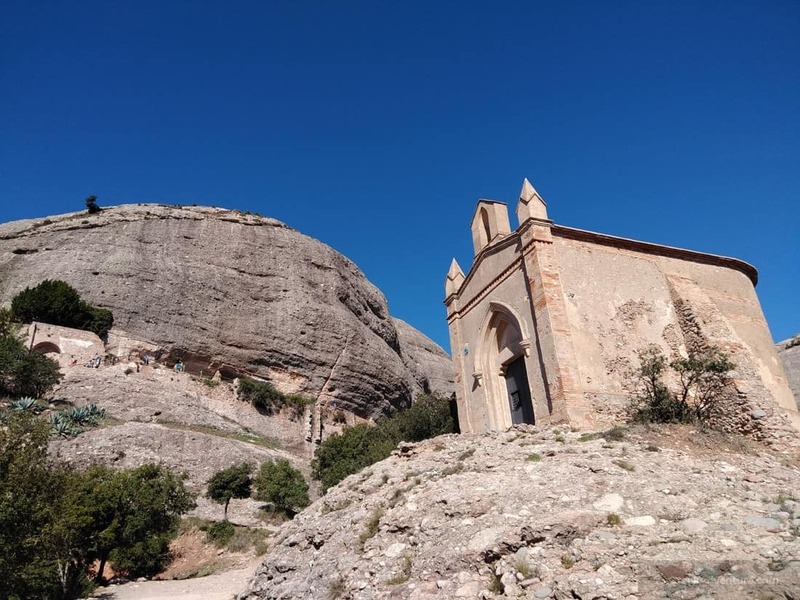 The other area is the area above the complex which hosts the hiking routes and all churches and old ruins of different monasteries. 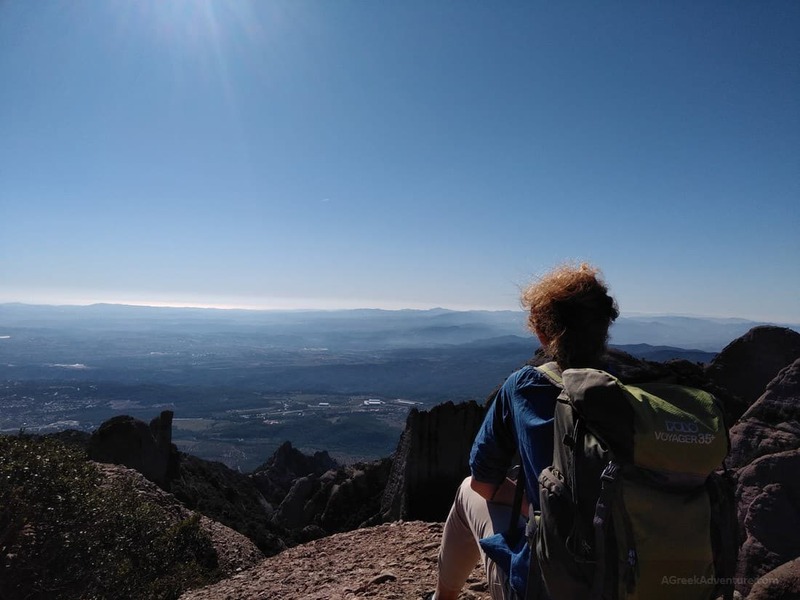 We advise that you do the hiking part first (if you came in Montserrat Barcelona for that too) and then have the time for the main complex and lunch. There is even a gourmet store with local products and a full service restaurant. 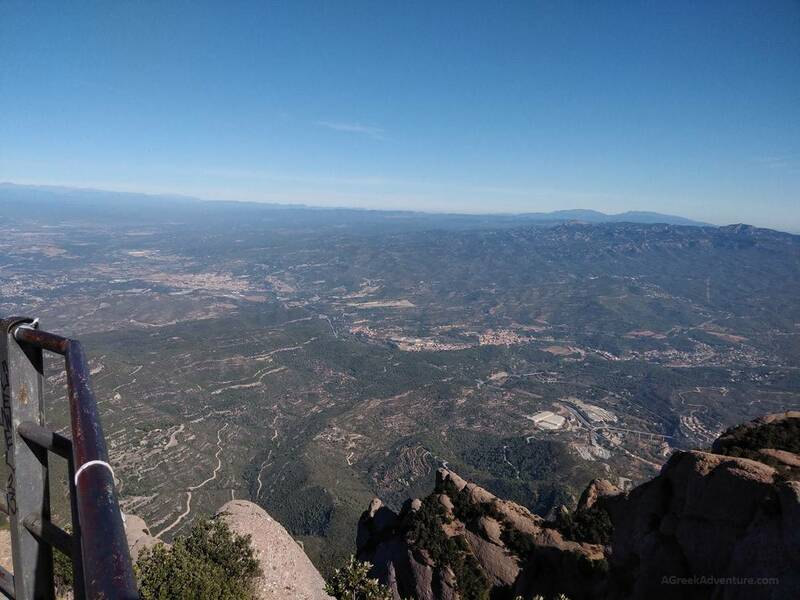 If you are the avid hiker type you can hike your way up to Montserrat, starting from the train station. Then you can continue towards the mountain tops. That’s a lot of hiking though. 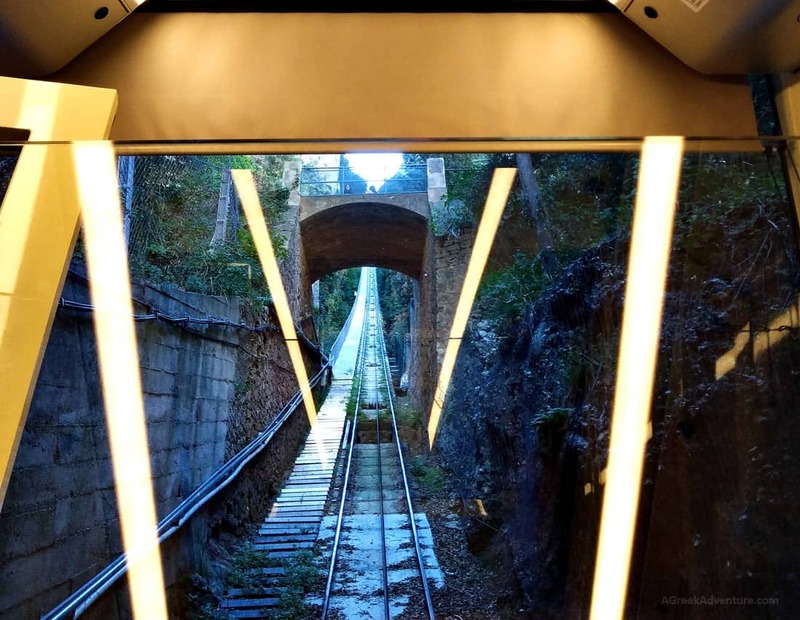 To get to the routes starting from the complex level you get this 2nd funicular of Sant Joan. You can walk up there but better so save some strength, as you can see it is pretty high uphill. All routes are well marked citing time and landmarks. Just plan accordingly as many are circular ones and night time will come at some point. Routes vary and spread to different directions but most connect after some point. When you see the signs of each route they seem like being of short distance each. But when you add them altogether you will find yourself hiking for hours. If you follow the long ones you will see amazing nature and all rock formations. So be in Montserrat Barcelona as early as possible. If you go there during summer season it will be really really hot. 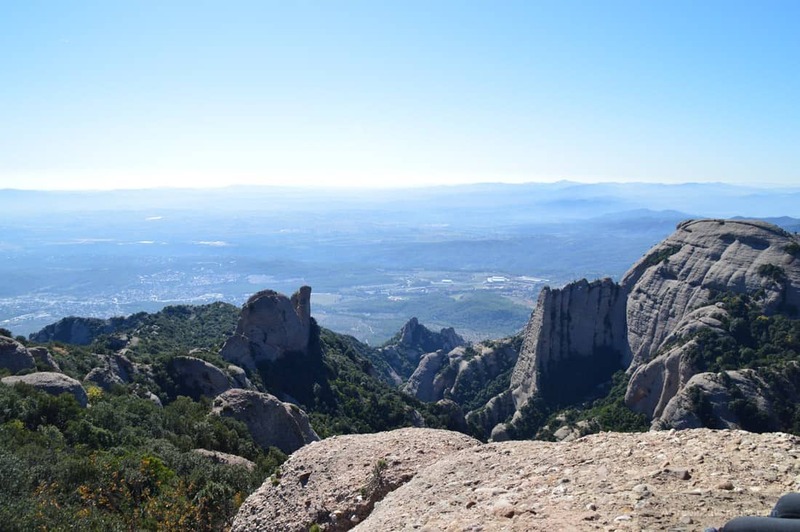 Barcelona heats up to 50 degrees (Celsius) and Montserrat is a mountain, so closer to the sun. Rock formations are almost identical to those of Meteora Greece. Meteora were supposed to be sea bed rocks that during millions of years were uncovered or brought up due to earthquake’s. Perhaps Montserrat falls under the same case. There are many steep paths like this one below. 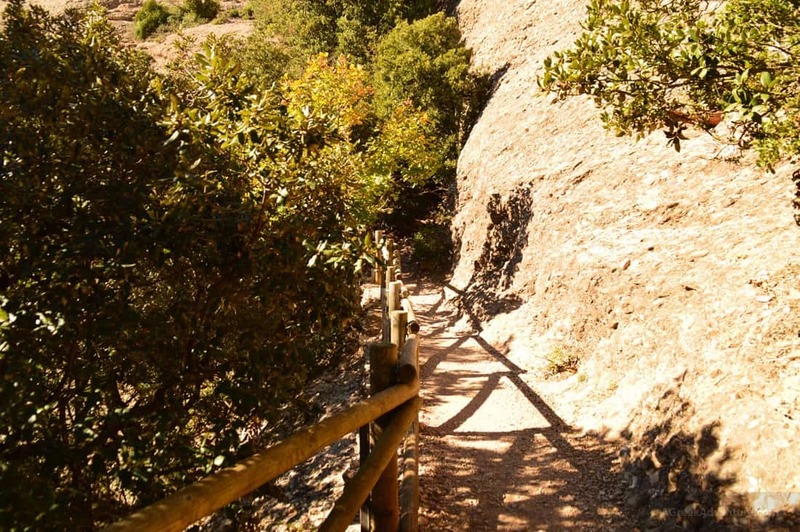 We advise you to start the hiking route, from the top end point of the funicular (Sant Joan). In that way most of the difficult parts like this one will be at your way back. After maybe 5-6 hours of hiking this matters a lot. 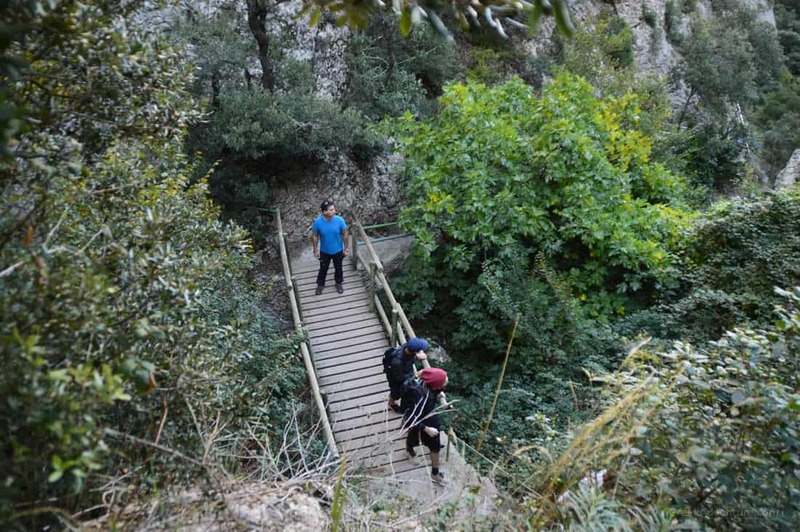 It will be rather difficult to have all that uphill going stairs at the beginning of your hiking. 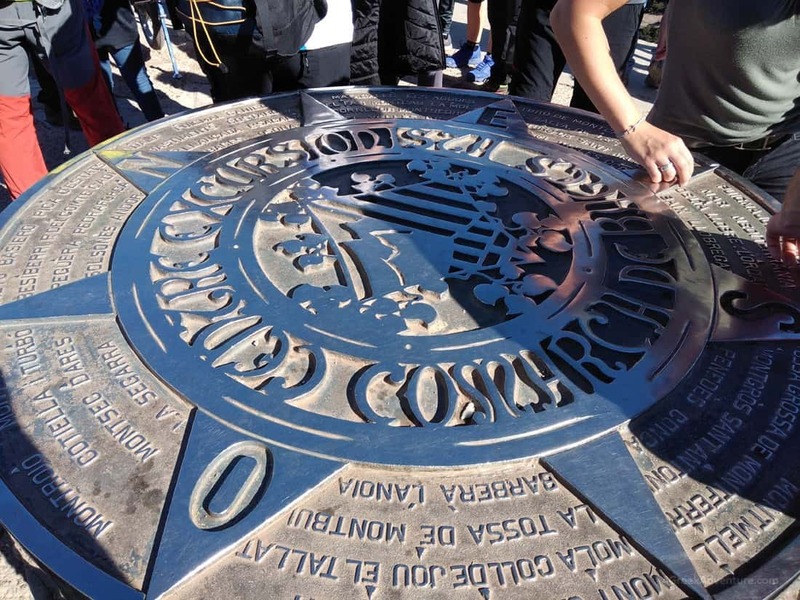 At mountain top a pretty big compass will show you the parts of Spain to any direction. You can book a hiking guide if you like, that will also tell you a bit more about the different landmarks along the hiking route(s). 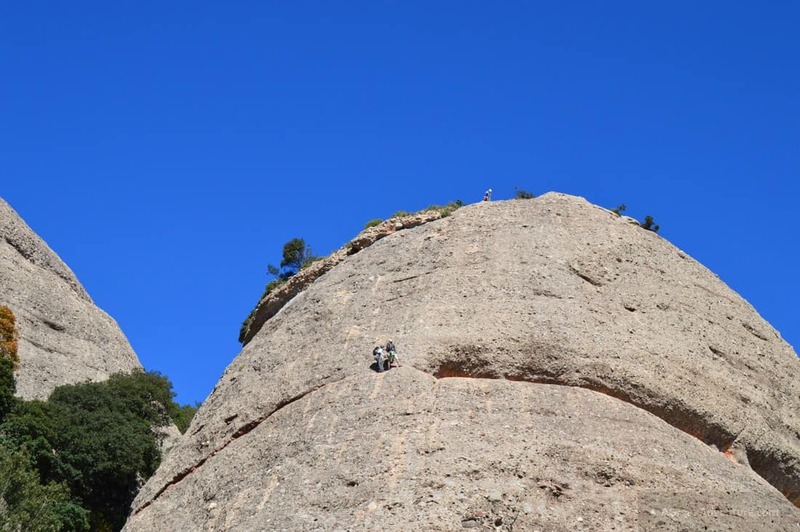 The routes (long ones) will take you to the top of the mountain, which (along with most of the rocks) is a great climbing field for rock climbers. On good weather you will see many as you hike around. It is a very vivid and good vibes place. Make sure you take plenty of water for the hiking part. Sun will play lots of games with light and shadow as you come back, and photos will become rather interesting. Apparently this is the main reason most visit Montserrat and resides at the heart of Montserrat. In the atrium (Atrium of Abbot Argerich) one can see epigraphs with blessings that come in different languages. The floor is equally spectacular. Many people stay for long just admiring the Atrium. 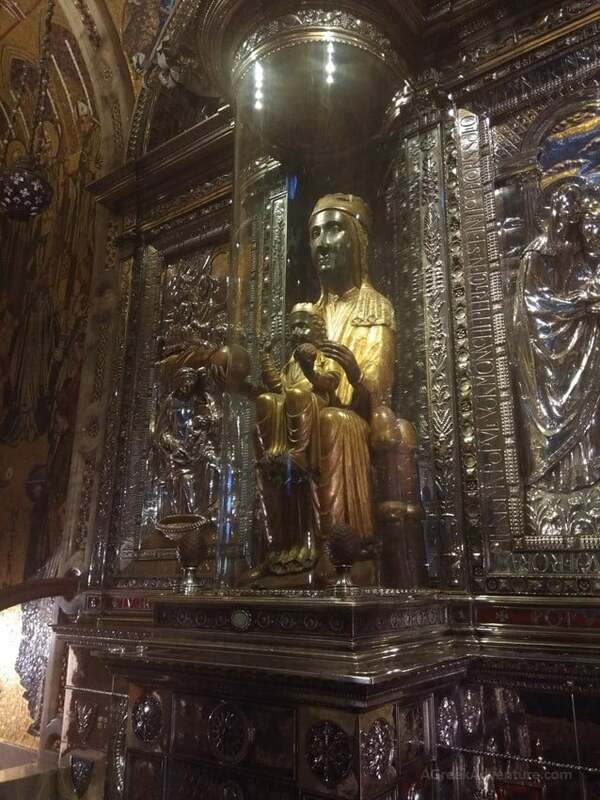 We also entered inside the church to visit the actual statue of Black Madonna. 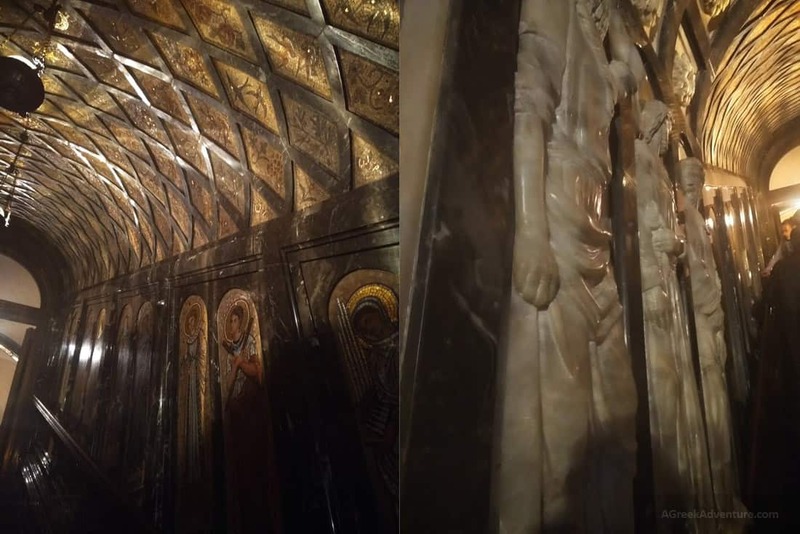 It was indeed something different as you don’t encounter such color on statues that relate to Virgin Mary. Locals told us that the color is due to the aging of wood. The statue is not very big but it is dominant. What else could it be, since millions of people during the ages walked in front and touched the exposed sphere/globe part of the statue? 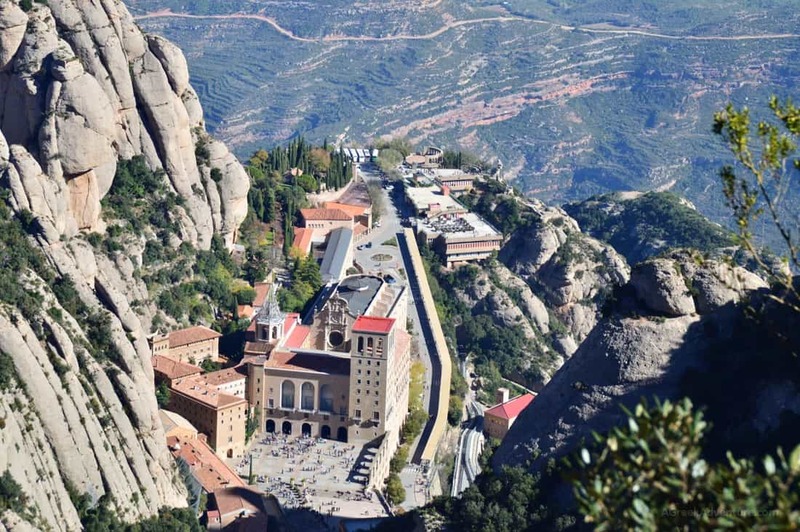 If you visit Barcelona, then getting to Montserrat is relatively easy. You can organize this by yourself. There is no need to do it through any travel/tourist agency. Needs very little “homework”. 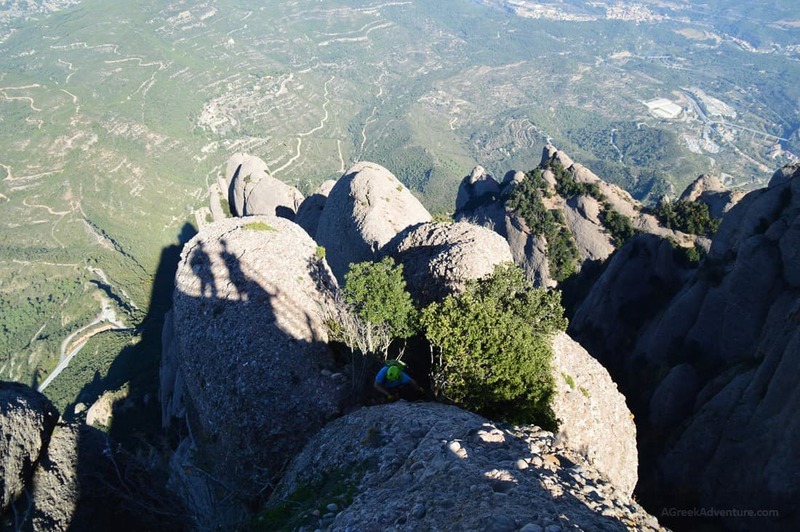 Montserrat will take your whole day, so plan this trip without anything else before or after. Better start early in the morning, especially if you visit during “hot” seasons. By hot we mean both the hot weather and tourists high season. 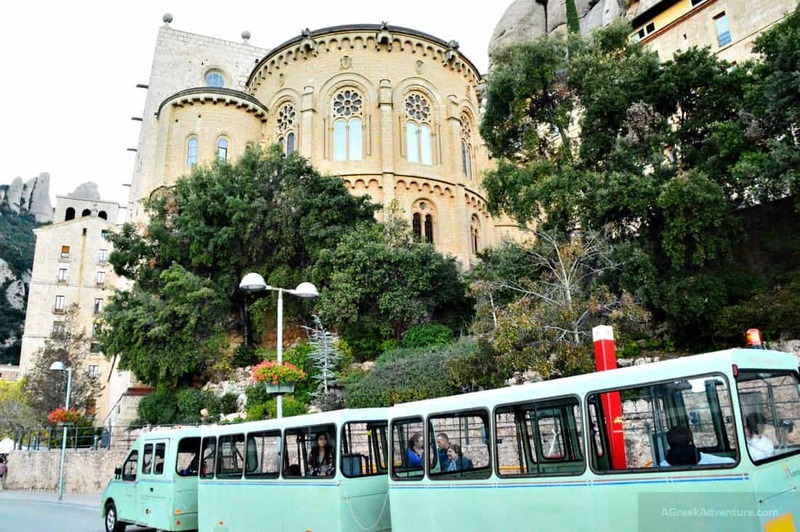 We started from Barcelona, visiting Montserrat Barcelona in late October and there were lots of people going there. Locals do visit too, not just tourists. It is a very popular destination. First find out if there is anything that may interfere with your trip. This means train strikes, any kind of works that blocks access, etc. 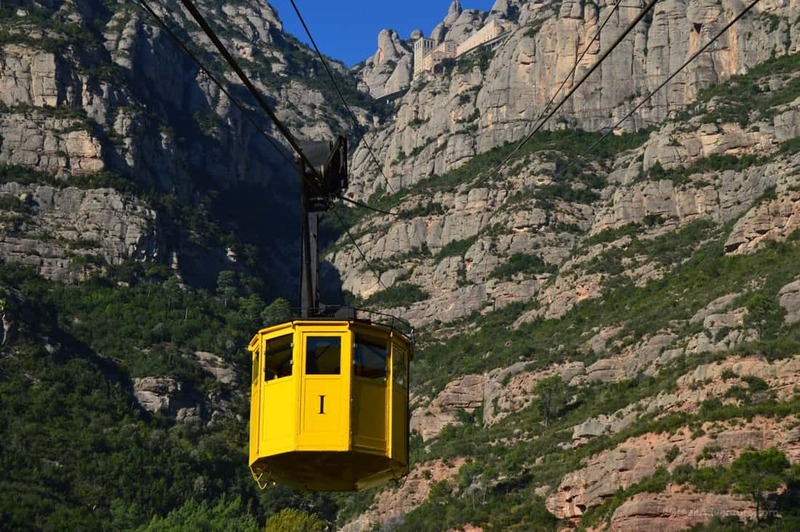 Montserrat mountain is accessible by cable car and by car. Cable car is far more impressive. To get there you take the FGC train from Plaza Espana Barcelona (Plaça d’Espanya) or Cremallera train. In the train station you will find the ticket vending machines with a variety of choices. You can get a combined ticket (for train, cable car, funicular for the very top) or tickets for each. Note that if you decide to just take the train ticket then you will need to wait in long lines to get the rest in each location. Depending on the season this may translate from 30 minutes to 1 or 2 hours. Before getting there we read in some travel blogs that getting to the actual train platform in Plaza Espana is confusing. It is not. Just follow the signs inside the train station. There are many railway employees who will guide you; even at the ticket vending machines they will help you get the right ticket. All speak English (at least). Be there a bit early for the following reason (except getting in line behind huge crowds). Train ride takes around 1 hour. Train seats are not numbered so be there early to stand in front and enter first. It is a first in, first sits case. The cable car takes another 10 minutes to take you to the top (once you are in). Of course you can bypass all these by getting your tickets online (official website) but make sure to be there early for the train (to get a seat) anyway. We went there early in the morning and spend all day. We hiked for more than 5 hours in the serene mountains, where nature changed its “clothes” constantly from rocky to green. 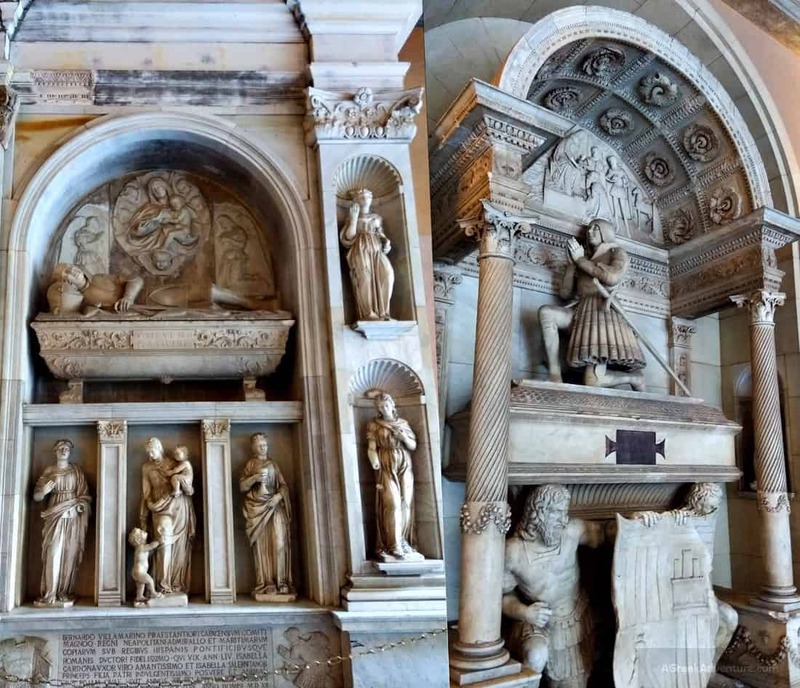 We visited Santa Maria and observed detailed artifacts and murals and paintings. We sensed the religious spirit, summoned there during the ages from all pilgrims. The feelings were a mixture of devoutness along with relaxation. The same feeling that someone has when they feel they spend their day well and fulfilling. 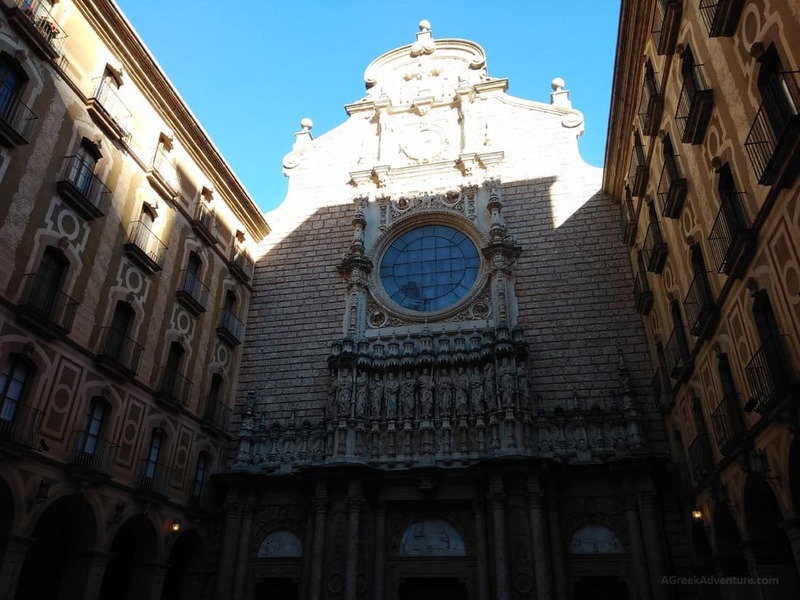 Make some notes for the things to experience and don’t forget to read our other posts for: Park Guell , Poble Espanyol, La Sagrada Familia & Barcelona. 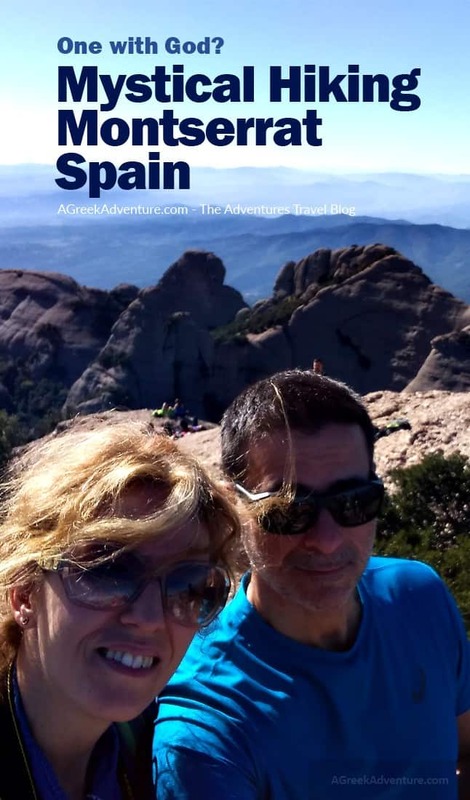 So Montserrat Barcelona is highly recommended. Plan an extra day in your trip. Enjoy. Please pin this below.